Frost each cookie with 1 tablespoon frosting. To decorate cookies: Unroll fruit snack rolls. Cut 24 rounds, using 2 to 3-inch cutter; cut each round in half. Place 2 halves, points overlapping slightly, on top of each frosted cookie to look like wings. 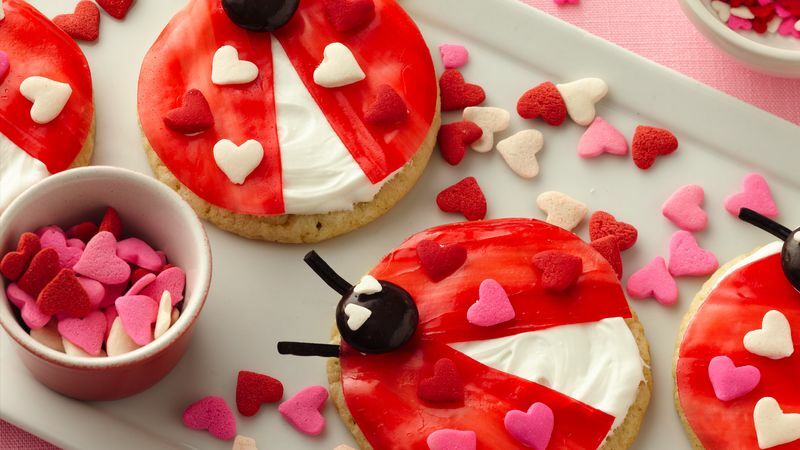 Using small amount of frosting, decorate each cookie with 1 creamy mint candy for head, small white hearts for eyes, licorice for antennae and large colored hearts for spots on wings. Store loosely covered. Substitute chocolate chip cookies for the sugar cookies for chocolate lovers. Don't have heart-shaped decors? Use confetti decors instead.